Data from space-based instruments, including NASA's recently deorbited Compton Gamma Ray Observatory (CGRO), have started to reveal the complexity of the gamma-ray universe, one that is hidden from ground-based astronomers by atmospheric absorption. Astronomers now recognize that some of the most powerful events in the universe, including the formation of black holes, are characterized by the emission of intense pulses of gamma radiation, so called Gamma Ray Bursters (GRB's), with energies almost beyond comprehension. Detailed studies of gamma rays can also provide much information about the creation of elements in supernovae, the formation of stars in newborn galaxies, and provide clues to some of the earliest events in the life of the Universe. 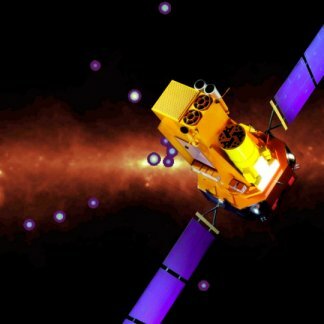 On October 17, 2002, a European-built satellite observatory called Integral was launched to carry out even more detailed studies of many of these mysterious high-energy objects, using the latest generation of high-resolution instruments. The satellite was constructed by the European Space Agency (ESA) in collaboration with scientists from Poland, the Czech Republic, Russia and the USA. In common with many ESA missions, the INTEGRAL spacecraft shares many aspects of its design and construction with other ESA probes, in this case with the XMM-Newton space-based X-ray observatory. The $330 million, 4.1 tonnes Integral satellite is composed of two main components, a service module which provides all the power, propulsion, navigation, and communications systems and a payload module which contains the 4 main science instruments. The service module is almost identical to that used by the XMM-Newton mission with minor modifications to allow it to be mated to and launched on a Russian Proton rocket. The science payload is composed of four main instruments, two of which, the spectrometer (SPI) and imager (IBIS), observe the gamma radiation directly with the X-ray monitor (Jem-X) and the optical camera (OMC), which allows identification of the sources of the gamma radiation. The spectrometer, imager and X-ray monitor are all what are called coded-mask telescopes, which use a series of perforated metal masks in front of the Cadmium Telluride and Germanium detectors instead of mirrors or lenses. The SPI and IBIS telescopes provide the highest resolution spectra and images of gamma radiation sources ever obtained, allowing astrophysicists to examine these objects in greater detail than ever before. The satellite was launched on a powerful Russian Proton booster, provided in exchange for observing time, into a 72-hour eccentric orbit, inclined at 51.6 degrees, with a perigee of 10,000 km and an apogee of 153,000 km. This orbit is very similar to that occupied by the XMM-Newton spacecraft and ensures that, for the majority of the orbit, the satellite is well above the Earth's radiation belts. This reduces the level of background radiation that the highly sensitive detectors are exposed to. It was planned that the spacecraft will operate for a minimum design life of 2 years but the mission has now been extended to December 31, 2014. Integral is providing more than enough new observational data to keep gamma ray astrophysicists busy long after Integral has completed its mission.